OWINGS MILLS, Maryland — Patrick Onwuasor was early in his college career at Arizona when he had a conversation with one of the team's defensive coaches. Onwuasor had played wide receiver in high school in Inglewood, California, but the coach pointed out the advantages of playing on defense. "We don't have enough safeties. We need some safeties. Wide receivers are a dime a dozen; safeties are special," the coach said. Onwuasor eventually switched to defense, and after transferring to Portland State he became a standout defensive back. He earned FCS All-America and all-Big Sky honors, starting 12 games as a senior. He helped Portland State go 9-3 in 2015, and he led FCS with nine interceptions (with 157 return yards). He also had 85 tackles, 49 solo. Last year, he came into his own, playing in all 16 games, with 13 starts and a career-high 88 tackles. This season, the 6-0, 225-pounder has started all 12 games for Baltimore and has 37 tackles. He had a career-high two sacks in a 21-0 shutout at Tennessee on Oct. 14. He snared his first NFL interception on Sept. 23 against Denver. He made a season-high eight tackles on Sept. 13 against the Cincinnati Bengals. "You have to have the mind-set to come in here and compete after one of my better years," he said before a recent practice. He is "coming to work to compete and going out and playing ball. Everybody is doing their job." Onwuasor continues to get more comfortable at inside linebacker after playing in the defensive secondary at Portland State. "Now I'm making more tackles. I used to get my hands on the ball more," he said. "I am flying around and making tackles." 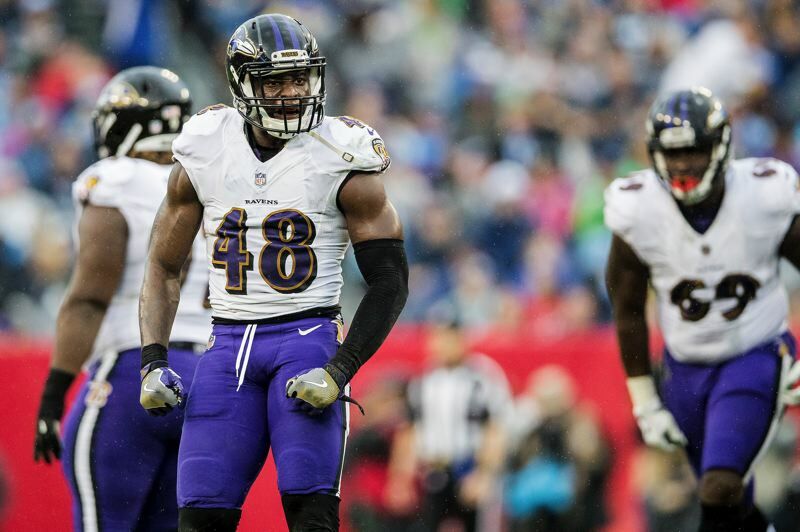 Onwuasor is part of a linebacker core that includes All-Pro Terrell Suggs and Alabama product C.J. Mosley, among others. Onwuasor spends most of his time with Mosley, 26, since they're about the same age and in the same life stage. The new defensive coordinator for the Ravens is Don Martindale, who was promoted after working with Baltimore linebackers. "The linebackers were a little jealous since he's leaving the (position study) room," said Onwuasor, with a grin. "He's done a great job. The intensity has gone up. Sometimes he'll pop his head in the (linebacker) room. He's still the same guy. We just like playing for him; we like playing fast and like playing physical." The Ravens defense has performed well, and Baltimore — 7-5 after last week's 26-16 win at Atlanta — hopes to make a playoff push in the AFC. Baltimore's remaining games are Sunday at Kansas City, Dec. 16 against Tampa Bay, Dec. 22 at the Los Angeles Chargers, and Dec. 30 versus Cleveland. "It feels great. We're flying around and feeling great," Onwuasor said. "Everybody is doing their job and doing what they have to do." The Ravens defense had a memorable moment in a 34-17 win over the Raiders on Nov. 25. All-Pro linebacker Terrell Suggs scooped up a fumble and ran 43 yards for a touchdown at home. Suggs looked to lateral the ball to a teammate but carried it like a loaf of bread into the end zone. "At first I saw him going to pitch it, and I'm going like, 'No! No! Don't do that! Then I saw a guy," Ravens coach John Harbaugh said. "There was a guy (on defense) coming, and (Suggs) was going to pitch to Jimmy (Smith). Then they had the defender coming. So, all's well that ends well." "I thought that was C.J., the way he was running," Onwuasor said. The Ravens made a change at quarterback when Heisman Trophy winner Lamar Jackson made his first start as a rookie Nov. 18. He took over for veteran Joe Flacco, who has a Super Bowl victory to his credit but was dealing with a hip injury. Baltimore beat Cincinnati 24-21 in that game and then beat Oakland in Jackson's second start. What has impressed Onwuasor about Jackson, the former Louisville star? "Just the way he handles his body language," he said. "He comes in here every day to work. He's preparing like a veteran. He's taking care of his body." For the Ravens defense, it doesn't matter who plays quarterback. "You have to come in with the whole game plan," Onwuasor said. "You have to be able to stop them. We have to be on point. It doesn't change the game plan." Off the field, Onwuasor and a teammate were part of a team outreach that served meals to those in need during the Thanksgiving holiday. "We're trying to give back as much as we can," Onwuasor said. While Onwuasor has not been back to PSU for a few years, in the past he volunteered at Mt. Hood Kiwanis Camp, helping people with disabilities. He graduated from Portland State with a degree in social science after playing 12 games in 2012 at Arizona, with one start, before getting kicked out of school because of criminal charges later dropped. Onwuasor said he learned a lot at PSU under position coach John Ely and head coach Bruce Barnum. Ely "did a great job of preparing me and giving me the tools that I needed. Coach Barnum also. They did a great job with the defensive schemes. They just ingrained it in me. We do some of the same things here." Onwuasor is not the only PSU product with the Ravens this year. Offensive guard Randin Crecelius, 22, has been on the practice squad. He's from Lake Stevens, Washington, and was signed by the Ravens on May 4 after he wasn't drafted. Crecelius, 6-5, 300, was a three-year starter at Portland State and appeared in 29 games, with 25 starts. He had made 21 starts in a row before he was injured as a senior last season. He was third-team all-Big Sky in 2016 and honorable mention in 2017 and 2015. Last season, the PSU offense gained 429 yards per game. "It feels good," Onwuasor said of having a college teammate in Baltimore. "The first thing I told him was don't back down from anybody. You have to earn it; you have to come in ready to work and be ready to compete."